Chandra Bose at Cellular Jail, Port Blair on December 30, 1943. Earlier on October 21, 2018, Prime Minister Narendra Modi had hoisted the National Flag at Red Fort and unveiled plaque to commemorate 75th Anniversary of formation of Azad Hind Government, formed by Bose. The 35-gram coin will be composed of 50% silver, 40% copper, and 5% each of nickel and zinc. It will bear the portrait of Netaji Subhash Chandra Bose saluting the flag on background of Cellular Jail. 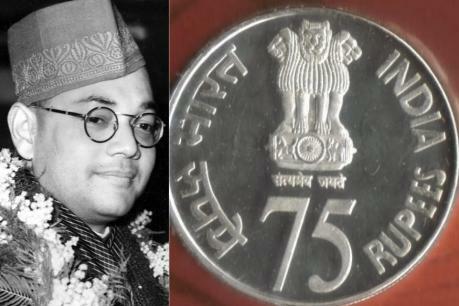 It will have the numeral 75th along with an inscription "anniversary" depicted below the portrait. It will also have an inscription in both Devanagari script and English saying 'First Flag Hoisting Day'. Subhash Chandra Bose on December 30, 1943 had hoisted the Tricolor for the first time on free Indian soil at Cellular Jail of Port Blair during his visit to Andaman and declaring the island as free territory from the British rule. It was much before India attained Independence in 1947. On same occasion, he had announced freedom of Andaman & Nicobar Islands (making it first Indian Territory) from the British rule and renamed them as "Shaheed-Dweep" (Martyr Island) and "Swaraj-Dweep" (Self-rule Island). The island at that time was liberated from British rule by Japan which captured it during World War- II. Major General Arcot Doraiswamy Loganadan of Indian National Army (INA) was made the Governor of the Andaman and Nicobar Islands. Q. Union Ministry of Finance has announced to release Rs 75 commemorative coin on the occasion of 75th anniversary of hoisting of the Tricolour for the first time by whom at Cellular Jail, Port Blair on December 30, 1943?